Playing at home on Nov. 10 in the first round of the City Section Division I football playoffs, Palisades High School destroyed the Carson Colts, 41-0. For the Dolphins (9-2 overall), this has been a season of firsts. On Nov. 5, the Dolphins beat Venice, 14-7, for their first victory over the Gondoliers in 16 years. This earned them a three-way tie for first in the Western League, and a home-field opener in the playoffs—the first they’ve had since Coach Tim Hyde came to Pali four years ago. Innocent Okoh manages to dodge through holes opened up by the line. Palisades parlayed a powerful running attack (more than 400 yards rushing) with a crushing defense as it dominated Carson. The Dolphins scored their first touchdown with three minutes left in the first quarter after senior Quinn Perry recovered a fumble on Carson’s 15 yard line. Senior tailback Innocent Okoh, who led the City Section in rushing this season, carried the ball three times for nine yards and senior quarterback Jonah Manheim ran for three yards before junior Rayne Camden took it in for the touchdown—his first of three during the game. Jake Taitelman kicked the PAT. Following the kickoff, Carson failed to make a first down and Pali took over on its own 39. Okoh and Marrio Lofton led a running attack down to Carson’s 14 (aided by a pass to Alex Vaupen) and Manheim then passed to Perry for a touchdown. The PAT was no good. The Dolphins surprised Carson with an onside kick that was misplayed by the Colts, resulting in Pali taking possession at the Colts’ 40. Three plays later, 6-2 sophomore quarterback Tommy Beattie passed to Okoh for a 14-yard gain, and then Beattie hit Perry for the TD with five minutes left in the half. The PAT failed. Leading 19-0, the Dolphins once again tried an onside kick, but Carson gained control on its own 35. The Pali defense forced another punt, and Okoh proceeded to return it 83 yards for a touchdown. Taitleman’s PAT was good, and the Dolphins had the game in hand, 26-0, at halftime. In the third quarter, Carson couldn’t move the ball and the Dolphins took over on their own 31. After runs by Okoh and Lofton, Camden broke loose and raced 50 yards for the score. Pali later scored two points on a safety, and Camden (listed at 6-0, 180) scored his final touchdown. He ended the game with 75 yards on 11 carries. Okoh, who is small (5-5, 170) but fast and elusive, ran for an impressive 254 yards on 27 carries—his 10th straight game with more than 100 yards rushing. Said Lofton, also a senior: “This was awesome. This is all about how our team works together.” He rushed for 105 yards in 18 carries. 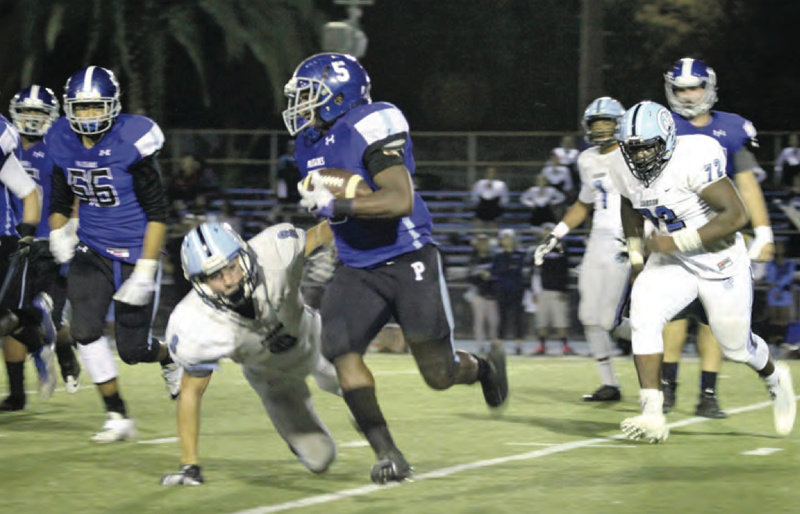 The sixth-seeded Dolphins will now travel to play third-seeded San Pedro this Friday. The two teams have identical records: 9-2.